Join us to celebrate the Return of the Quest for the Golden Prim at Fantasy Faire – and rescue some of our characters! Join us today, Saturday 27th April, at a party at the Explorer’s Club (Oriental Branch) from 2pm – 5pm to celebrate the relaunch of the Quest for the Golden Prim. And – as the party begins, we suspect that some – at least – of the Fugitives will be safely under lock and key! 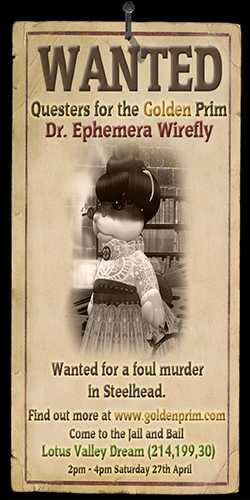 We’re combining a party to celebrate the return of the steampunk/gaslamp fantasy webcomic, The Quest for the Golden Prim with a Jail and Bail event to raise funds for Relay for Life at the Fabulous Fantasy Faire. 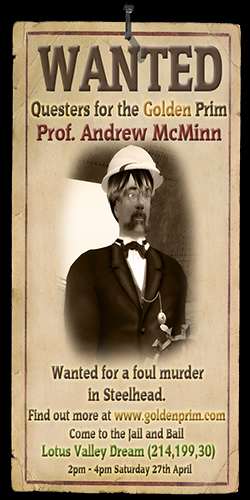 Followers of the web comic may recall that the three academics were falsely accused of murder in Steelhead but were fortunately able to escape from jail – only to find Steelhead threatened by a massive volanic eruption. Now we will be serialising Volume 2 on our new website at www.goldenprim.com – and we are planning to release a new installment each week, accompanied by games and contests. So do come and join us from 2pm – 5pm today, to celebrate the relaunch of the comic, to explore the amazing Explorers’ Club, and to donate some Lindens to a very good cause! 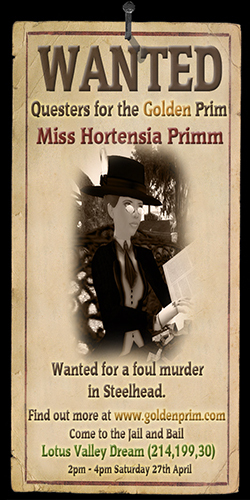 Previous Post: Prim Perfect Jigsaw at Fantasy Faire – The Quest for the Golden Prim Returns!